With a free breakfast an indoor pool and complimentary Wi-Fi La Quinta Bend offers a comfortable non-smoking place to crash after a busy day in Bend. La Quinta Bend is a three-story 65-room non-smoking hotel featuring coffeemakers and free Wi-Fi â?? so you can stay caffeinated and connected in the comfort of your room. Cable TV with premium channels will keep you entertained before you drift off to sleep. Kick start your day with the complimentary breakfast which includes waffles hot and cold cereal pastries fruit all the coffee you can drink and more. The indoor pool provides access to year-round liquid relaxation. Local calls are free; so is parking. Your furry four-legged doggie friends are welcome. La Quinta Bend is located off Highway 97. Downtown Bend offers lots of shopping drinking and dining options two miles away. Guests can shop for a deal at the Prime Outlet Mall less than a half mile away. Adventure-seekers can top off at Mount Bachelor 22 miles from the hotel. 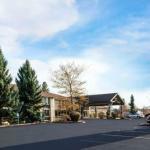 The hotel is 18 miles from the Redmond/Bend Airport. Dogs of all sizes are allowed. There are no additional pet fees. There is a pet waiver to sign at check in. Dogs must be leashed and cleaned up after. They prefer that dogs are not left unattended in the room, but if you must be out for a short time, they must be crated.